Spinning Diamonds & Rocket Ships – Love. Life. Practice. Ever heard of Maslow’s Heirarchy of Needs? Pretty straightforward: People have to have the lower levels of the pyramid in order to be able to have the ability to worry about the higher levels. The idea is that if you don’t have food, you’re not going to be trying to figure out how to buy a house; if you don’t have a sense of being loved, of belonging, you won’t we sitting there trying to develop your self-esteem. There’s a lot of talk and discussion about its efficacy and imperfections as a metaphor, but for the most part, it works pretty well. What I’ve been pondering for a while now is the fact that in this Recession, there’s a strange effect going on. I know people who are loved and respected who have had to file bankruptcy. I know people who are at the top of their game career-wise but had their house foreclosed. I see people giving all kinds of volunteer time to good causes, even while they aren’t sure where they’re going to be sleeping next week. The “gift” that things like the internet and social media have given us is that we can be without some of the basic needs – like reliable food, water, shelter – but have access to a vast social network, contact with our friends, etc. At the same time, status symbols that used to be assurances of those basic needs – “President & CEO”, “Ph. D.”, “Certified [Insert Occupation Here]” are still valid for cultural recognition, but no longer a sure way to put food on the table. 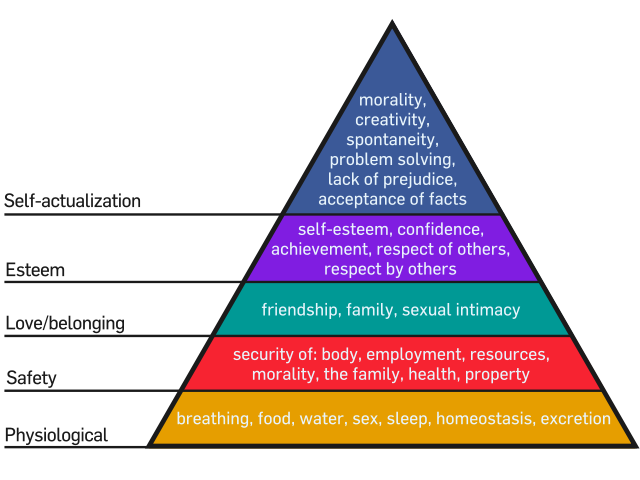 Of course, the thing about Maslow’s pyramid is that the base supports the other levels, like any good pyramid. The minute I looked at my metaphorical diamond, the problem became evident: in this kind of world, it’s very hard to maintain your balance. Diamonds are beautiful, they are tough, but their points are not necessarily known for being stable platforms. In fact, they are rather better known for cutting. He is balancing a diamond…on a blade of grass. So how does one make a diamond shape like that stable? My first thought was to put it into a three-dimensional form and spin! Much like the top in my favorite movie, if you keep the momentum going you usually manage to maintain your equilibrium. In fact, the more I thought about it, the more I realized that’s basically what I did when, five years ago, I had the immense change in job, family, loved ones, etc. Since then I seem to have become, as one person put it, a “natural-born nomad”, and have traveled more in the last few years than I did in all the previous forty. So far, so good. It hasn’t been easy, but there have been many, many blessings in the forms of experiences, friends, lessons, and challenges. This very blog has come directly out of the “growth opportunities” that travel and keeping in motion has presented me. However, just as you see from the animation, eventually you get tired. Eventually you have to stop, come to rest. Perpetual motion is a myth, and while spinning a diamond of scarcity may work for a while, it eventually falls over. Trust me. What then? Well, my answer has been: pick myself up and start spinning again. As I said, so far, so good. Even the “stopping” points are getting easier. But it’s certainly not for everyone, and I have been wondering – literally for months – about how the metaphor works for people who don’t want to spin. The answer came yesterday on my front lawn. I was enjoying a smoke with my friend Jay, and we grew to talking about this concept of Miller’s Diamond of Scarcity (he didn’t laugh too hard at the egotistical title. This is why he’s my friend). I explained the idea of spinning, and he nodded wisely over his pipe (he’s a pipe man; I’m a cigar man; still, we get along). “I can think of another way,” he commented. The more I thought about it – the more I look at it – the more I like it. Jay used the analogy (and example, as we both know people who have done this) of shared houses, of communal food prep, of the resurgence of barter in communities both online and off. I’ve had acupuncture treatments in exchange for coaching sessions; I have friends who can’t afford a house band together and live in beautiful neighborhoods because they can pool their meager resources. Is it perfect? No, not at all, neither as a metaphor nor as a reality. The more you think about it, the more flaws and dangers you can find. There still isn’t a very broad base of support, just multiple points. And the connections between people are notoriously tenuous, people being as people are. But at the same time, both strategies – spinning, or adding diamonds – seem to be better than just falling over. Perhaps there are more strategies, including those for actually re-building your base (though I can tell you, once it disappears, you have a hard time believing it ever really comes back). And besides…Jay’s model? Looks like a rocket ship.